After Shave Splash Cologne for men is made with aloe vera, menthol and witch hazel to help close pores after shaving, while adding a pleasant, refreshing scent. After Shave Splash Cologne is used after shaving to help tighten and close the pores on the face, or as a refreshing cologne. It comes with your choice of fragrance or an essential oil blend. This after shave contains menthol, aloe vera and witch hazel for its soothing and antiseptic properties. It is a an invigorating scented after shave and cologne that can also be also used on the body. The formula contains natural glycerin, which makes the splash a little thicker, but also easier to use. 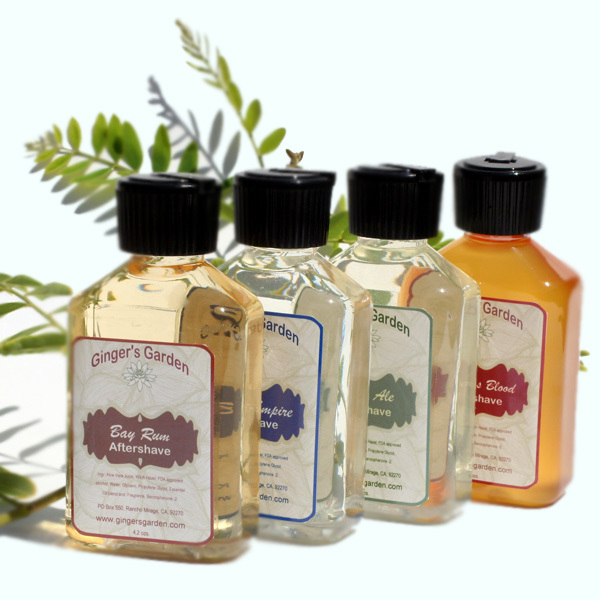 The photo shows Bay Rum, British Empire, Ginger Ale and Dragon's Blood but you can choose any scents that are listed in the "Scents and Essential Oils List". Keep away from eyes as this aftershave splash cologne contains menthol. Each aftershave bottle comes with a unique cap that has a flip up spout. It’s easy to dispense and use just the right amount. NOTE: The photo shows 4 aftershaves for illustrative purposes only. With each purchase, you get ONE aftershave with ONE choice of fragrance. NOTE: Choose your scent from the Scent List available at the top of the HOME page, then type your choice in the comments section of the shopping cart when you check out. The photo shows some of the fragrances available and is for illustrative purposes only. BAY RUM – Timeless, herbaceous classic with a hint of sweetness. GINGER ALE – Just like a well known fizzy drink or soda, this fragrance has refreshing and bright notes of lime and lemon, ginger and a drydown of musk. DRAGON’S BLOOD – Rich earthy and grounding scent with notes of amber, dark woods, aromatic cedarwood and patchouli. MENTHOL SNOW - COLD! Made with spearmint, peppermint, corn mint, Corsican mint and lots of menthol. Ingr: Aloe Vera Juice, Witch Hazel, FDA approved alcohol, Water, Glycerin, Propylene Glycol, Essential Oil blend or Fragrance, Menthol, Benzophenone -2.